Founded in 1970, the Schola Cantorum has had just three directors. The first was Fr. Frank MacNamara, a well-known organist, teacher and graduate of UCD who worked closely with Mabel Swainson who was Head of Piano Studies for the first fourteen years. This was a most fruitful time and many of the Schola’s most prominent alumni studied at the college during Fr. MacNamara’s tenure. Shane Brennan was appointed director in 1984. 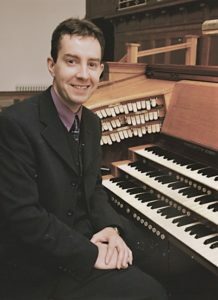 A first-class B.Mus and MA (Musicology) graduate of UCD, Shane is very well known as an organist and choral director in Ireland. He also served as Director of music at Whitefriar Street Carmelite Church in Dublin, and as Organist & Choirmaster to the Cathedral of Christ the King, Mullingar for some 14 years. The present director is Gerard Lillis. Appointed in May 2003, Gerard is an honours MA (Music) graduate of NUI Maynooth, where he held the coveted position of organ scholar for 2 years in succession at the university. Gerard also holds a performance diploma from Trinity College, London, a Higher Diploma in Music Technology, and has served on the staff of the Irish Church Music Association summer school for many years. A full-time teacher at Our Lady’s Bower in Athlone (1993-2003), Gerard has also gained much experience as an Examiner and Advising Examiner for the State Examination’s Commission, and has adjudicated at many feiseanna throughout the country. In 1997 he was appointed Organist and Director of Music at the Cathedral of Christ the King in Mullingar, a position Gerard held until September 2017. To date Gerard has produced four CDs and in 2002 directed the Cathedral Choir which was selected as overall winner of the Lyric FM’s Choirs for Christmas competition. In his role as Director, Gerard administers the day-to-day operation of the Schola. All students receive their organ, composition, and choral training directly from him, and the teaching of Leaving Certificate Music is his responsibility. The small number of students in the Schola (approximately 20) also enables Gerard to fulfil the role of personal mentor to each student.